Where can I purchase Vivamune Health Chews? Vivamune Health Chews are available for purchase directly from Avivagen Animal Health, via this website. Stay tuned to this site for our upcoming launch of our new range of Vivamune Health Supplements. Can I give Vivamune to my new puppy? Vivamune™ Health Chews can be given to healthy dogs as young as six weeks of age to support and encourage their own natural immune function. Senior pets can also greatly benefit from Vivamune Health Chews! What age can you start your pet on Vivamune? Vivamune is safe for puppies and kittens from 6 weeks of age. Are there any side effects to taking Vivamune? Vivamune has undergone rigorous safety studies with doses up to 10X overdose with no side effects. The active ingredients in Vivamune are natural products, much like the supplements you take for your own health. Should you have any concerns that your pet may be experiencing any side effects please contact your veterinarian immediately. Is Vivamune safe for food allergic dogs? In our experience with several thousand dogs we have not received any reports of adverse effects in food allergic dogs taking Avivagen’s canine supplements. If you have any concerns about your food allergic dog please discuss the use of Vivamune with your veterinarian or call us at 1-855-210-2355 for further information. Is Vivamune a safe product? Yes, when administered according to the “Instructions for Use” shown on the label Vivamune is a very safe product. In safety trials dogs were given more than 10 times the recommended dose of Vivamune for one month and there were no adverse clinical or physical effects seen. If you have any concerns about safety please call 1-855-210-2355 to speak with one of our representatives or consult your veterinarian. Avivagen scientists realized early on that the diversity in the chemical and structural nature of the carotenoid breakdown compounds was key to their health benefits. Each compound within the mixture has the potential to interact and affect different pathways in the body. Through their combined activities, carotenoid breakdown compounds are able to have an overall health-promoting effect. Recognizing the vital role that the chemical diversity of the carotenoid breakdown products played, the Avivagen team set out to develop a product that would capture this diversity by combining different carotenoids in a formulation known as OxC-beta™ Technology. The formulation is intended to provide for the generation of a multitude of beneficial breakdown compounds in the body after the product has been consumed. As a result of this work Avivagen has been able to capture in Vivamune Health Chews the healthy essence of carotenoids. Nature has pointed the way and the application of science has allowed us to understand and harness the benefits, all in a little health chew! Carotenoids are naturally occurring organic pigments that are responsible for the distinct bright colours of many fruits and vegetables. Some of the more commonly encountered dietary carotenoids are ß-carotene, lycopene, lutein and astaxanthin. In addition to their role as plant pigments, carotenoids, for example, ß-carotene and lycopene, have been associated with health benefits in humans and animals, particularly in supporting the immune system. Avivagen’s founding scientists made the landmark discovery that many of these health benefits result not from the direct activity of the carotenoids themselves in the body, but rather from the activities of compounds produced when carotenoids, such as ß-carotene and lycopene, are broken down by natural processes. The active carotenoid breakdown compounds can form either outside the body, or inside the body through the metabolic processing of the carotenoid. Both are naturally occurring processes that produce a myriad of breakdown compounds with diverse chemical characteristics. These carotenoid breakdown products are abundantly present in nature, for example, as contributors to the fragrance of flowers and to the formation of the protective, outer wall of pollen grains. Arabic Gum, an emulsifying and stabilizing agent commonly used in producing food products. Brewer’s Yeast, Oat Flour, Oat Meal, Rye Flour, and Soy Lecithin. There are basically two categories of yeast: baker’s and brewer’s. If an animal is allergic to baker’s yeast that does not mean it is allergic to brewer’s yeast. It is baker’s yeast that typically causes candidiasis or other yeast-related problems. Therefore an owner is advised that the pet must not have any yeast or products containing yeast, like breads, for example. Also typically recommended is the elimination of sugars, starches, and gluten because candida feeds off them. Our formulas contain brewer’s yeast. However it is of the utmost importance that you check with your veterinarian on the specific allergy your pet has. Is it baker’s yeast or brewers yeast? Until that is ascertained, we do not recommend using any of our formulas that contain brewer’s yeast. If an animal has allergies to soy or other grains listed they should avoid the product. Like almost all supplements, we cannot rule out every allergen to meet the needs of all pets with allergies. Where are Vivamune Health Chews manufactured? Vivamune Health Chews are manufactured exclusively for us at a GMP facility in the United States. This gives us complete oversight as to the quality of ingredients being used in our products. Where are Vivamune Chews manufactured? Vivamune Chews are manufactured exclusively for us at a GMP facility in the United States. This gives us complete oversight as to the quality of ingredients being used in our products. How can one little chew possibly offer all those benefits? Vivamune has the unique ability to help your dog’s first-line immune defenses and at the same time support a healthy and normal inflammatory response. Taken together, Vivamune’s diverse activities promote optimal immune function, which leads to far reaching benefits in many parts of the body. Healthy Joints & Mobility – Have you lost your walking partner lately? While it is normal for our pets to be less active as they get older, aging should not be an uncomfortable process. Luckily, there are steps you can take to help your best friend regain the quality of life that they deserve. Vivamune promotes healthy joint function and mobility by supporting a normal inflammatory response which means you can enjoy more play time together. Healthy Digestive System – The digestive system contains the largest proportion of immune cells in the body and constitutes almost 70% of the entire immune system. This innate system forms the first line of defence against foreign pathogens and is vitally important in the maintenance of healthy immune function. By helping to support and maintain a healthy immune system, Vivamune promotes normal intestinal function. Healthy Skin – One of the first signs of a poorly functioning immune system may be a lacklustre appearance and changes to the skin. By supporting the immune system, Vivamune helps to promote healthy skin condition. Why is Vivamune beneficial to my dog? Vivamune Chews work from the inside out to support your pet’s own natural defence mechanisms and have been scientifically shown to promote healthy joints and mobility, a healthy immune system, healthy skin condition, normal intestinal function, and it may also reduce grooming time (in dogs). Enhancing the function of the innate immune system within the gut. Supporting a healthy and normal inflammatory response. What are Vivamune Health Chews? Vivamune™ Health Chews are unique! No other supplement contains our OxC-beta™ Compound. 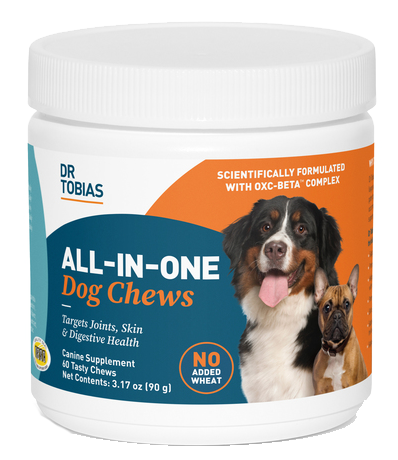 OxC-beta is formulated to provide a source of natural breakdown products of carotenoids in a convenient-to-use, flavoured health chew. The active ingredient in Vivamune™ Health Chews has been scientifically demonstrated to support your pet’s immune function. You will do anything to keep your dog healthy. They will do anything to get a tasty chew! Receive the lastest pet health tips, promotions and contests!